Notification about an end of delivery of "Samurai cut down" and "GunsΠrates"
"Mushroom Garden HD" and "Mushroom Garden Seasons HD" are released! Enjoy flashy battles with simple 1 finger controls! Seasonal Funghi became more colorful!! Let's lure many funghi and go on a little walk with them!! Now Funghi and its friends are out of "Garden"!! Mushroom Garden to the Next Stage----. When you discovered the egg again, your gourmet life with Mogumon starts again! Newbie Detective Mackenzie and her assistant Funghi are at it again!! "Touch Detective" tackles new and even stranger cases and mysteries!! 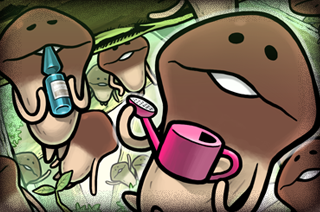 With her assistant Funghi by her side, our heroine the rookie detective Mackenzie investigates mysteries!